If you have a craving for real, authentic, British clotted cream, look no further. 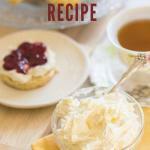 This clotted cream recipe is the real deal! 0.2 What is Clotted Cream? 0.3 What is Devonshire Cream? I was first introduced to clotted cream while living in the Cotswolds in England. We would go for tea at least once a week in charming little yellow stone tea houses. It was lovely. To be completely honest, when I first heard of clotted cream, I really didn’t want anything to do with it. I mean, who would want to eat any kind of dairy with the word “clotted” in it? And really, it doesn’t actually even look that appetizing! But once you’ve spread this delicious condiment on a hot scone, there’s just no turning back! If you’re unfamiliar with clotted cream, sit tight, because I’m about to rock your world! 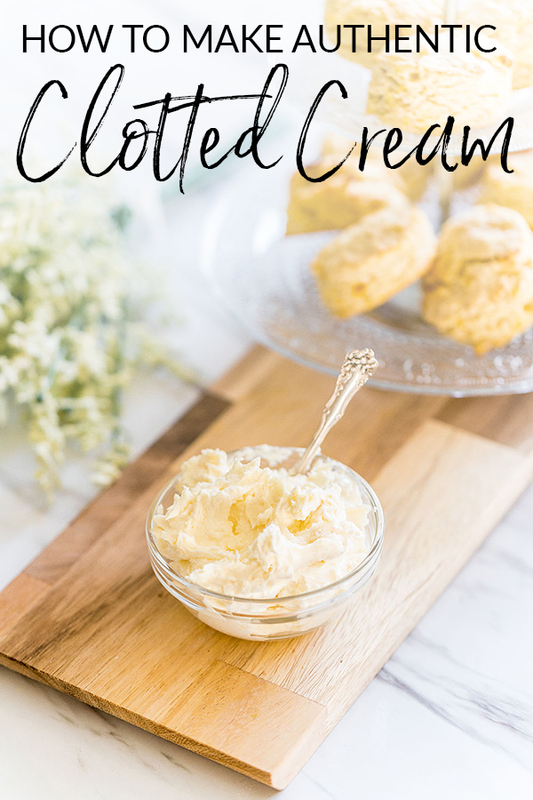 But when you see the ingredients in this clotted cream recipe, you might laugh, but I promise you it’s worth your time. 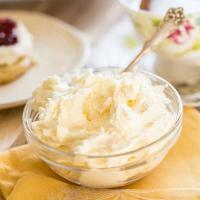 Clotted cream is a rich, creamy goodness that you can spread on just about everything. I love to eat it on scones, but you can put it on cakes, french toast, muffins, pretty much on anything in place of butter. 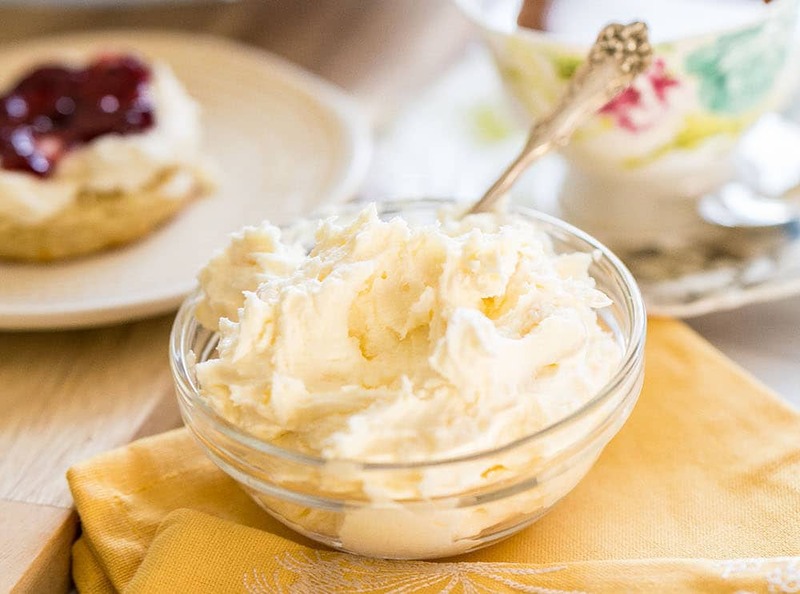 You may see a lot of recipes out there involving cream cheese and sugar, claiming to be “Devonshire Cream” but that is just another name for clotted cream. Don’t be fooled by those recipes. While delicious, THIS is the real deal and this is how to make clotted cream! If you’re really fascinated by this stuff like I am, you might appreciate a little history of clotted cream. It has long been disputed weather it originated in Cornwall or Devon, and sadly, we may never know the truth! Clotted cream was originally made by farmers to reduce the amount of waste from their milk, but it has now become a southern British icon! 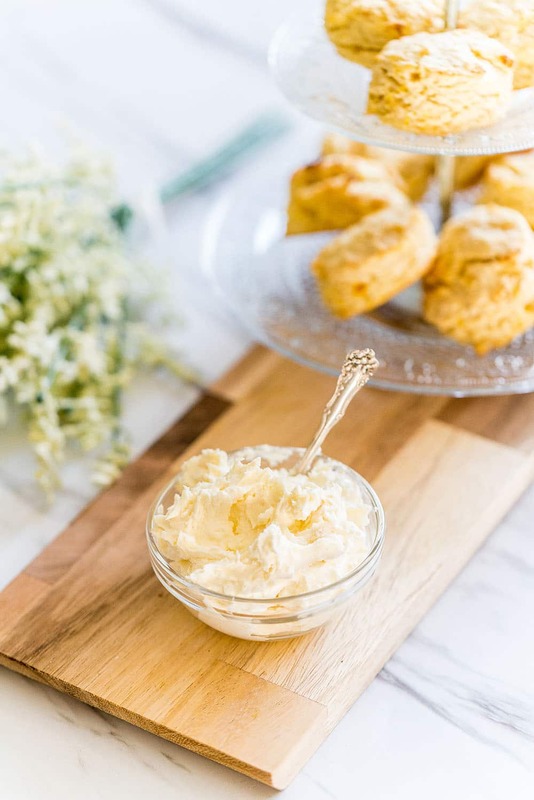 These days, you can find clotted cream in British supermarkets and teahouses, usually eaten on scones with cream tea, afternoon tea or breakfast. Try this orange scone recipe for the perfect pair to your clotted cream. Once I returned home to the US, I sadly, could not find clotted cream anywhere! So I had to learn to make my own. Making clotted cream is really more about the method rather than the ingredients, but you do need to be sure to pick the proper cream. Find a heavy whipping cream that has not been ultra-pasteurized. If you can find raw cream, that’s even better. Check with your local dairy or try a health food store. The pasteurized cream will still work, you just might have more separation. Not a big deal. You’ll want to allow around 24 hours for the entire process of making clotted cream. Preheat your oven to its lowest setting (usually 180 degrees Fahrenheit). Pour one pint of heavy cream into a glass 9×13 pan. Cover the pan tightly with aluminum foil. Be sure the edges are sealed well. Leave your pan of cream in the oven for about 12 hours. You want the top layer of cream to be lightly golden. I usually do this step at night before I go to bed and wake up to the most heavenly smell! When your cream is done cooking, remove it from the oven and let cool until the pan is safe to touch. Place the pan in the fridge for another 12 hours until the cream has solidified and become clotted! Remove your pan from the fridge and bottle up your delicious goodness! There may be some separation. Leave the liquid in the pan, but if your cream seems too thick, add in some of the liquid and stir. Enjoy your clotted cream on homemade scones, or whatever else you want to spread it on (which is everything for me). Your clotted cream will be good in the fridge in an airtight container for about a week, so eat it up quickly, which shouldn’t be hard! 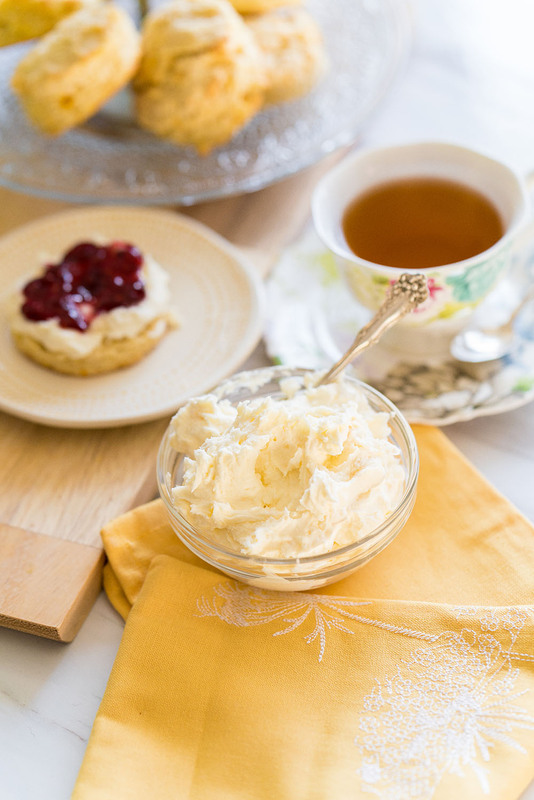 Enjoy this authentic British classic with this easy clotted cream recipe. Preheat oven to lowest setting (around 180 F). Pour heavy whipping cream into a 9x13 glass pan. Cover tightly with foil. Put the pan in the oven for about 12 hours until the top is lightly golden. Move to the fridge for at least 12 hours until cream is solid. Scoop into a jar and serve with scones or anything else.